I charge a flat rate of $650 for a ten-hour period of time of your choice to rent Whittington Place. For that price, you receive the use of the large cathedral room, an adjacent living area with small kitchen, a private bedroom with bath and two other wheelchair accessible bathrooms. Additionally, the rental fee includes the use of 10 round white tables that seat eight each, seventy mismatched chairs, four pews, and four other various sized tables. There is also a sound system available with an extra set-up fee of $25. If you need fewer hours, I will rent the venue for $450 for six hours on certain dates. One must decorate and clean-up within the span of the six hours. Please contact me to see if the date you would like is one that can be rented for the lesser amount of hours. 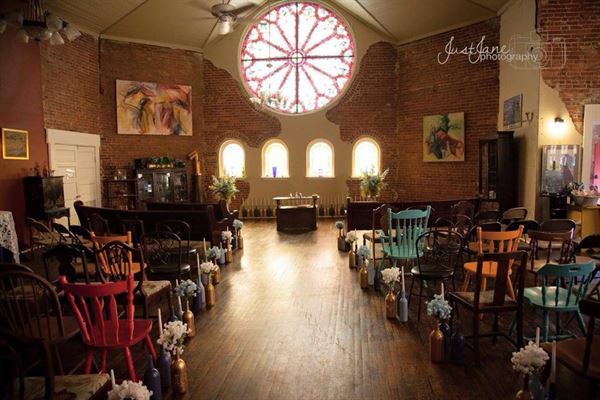 If you simply want to get married in my lovely old church building, I will, on certain dates, rent the space for $300 for three hours and for $375 for the three hours if I perform the marriage ceremony. I am an American Marriage Ministries minister and am registered in Garland County to perform marriage ceremonies. These prices are walk-in prices so one must inspect the venue to make sure the space suits your needs for the ceremony without further decoration. I am basically a do-it-yourself venue. You can use whatever florists, caterers, planners that you like—or you can do it all yourself. I require a $200 non-refundable deposit to secure a date as well as a short contract. The $200 is deducted from the total amount due. That amount is due 30 days before your event and is non-refundable. ! have set the maximum capacity for my venue at 100 people. Contact us for complete terms & conditions. A place of tranquility and beauty waiting for a special moment in your life. We had our rehearsal dinner at Whittington Place and the location and ambiance was fabulous. There were 60 guests and all had a great time. The facility had a kitchen and plenty of bathrooms and everyone was able to converse without having to fight a lot of background noise. Kristine was very easy to work with and she went out of her way to make sure we had the perfect setting for our event. I highly recommend them and would choose this place again in the future!